Amanda Meggison is a cake-baking, marathon-running, certified nutrition specialist whose enthusiasm for living beautifully fuels her passion for a plant-based diet. Amanda and her website, Tarian Pantry are all about Food and Fitness. After following a vegetarian diet for over 20 years, my husband Zac and I started to become more aware of our vegetarian food choices. We didn’t drink milk or eat eggs but we did eat cheese and as our awareness grew, our questions regarding our choice to eat this product became more. There is still cruelty in the process of vegetarian products and this started to concern us. As a personal challenge, we decided to go vegan for 3 months to see how we would fare and over 5 years later we are still following a 100% vegan diet. There is no turning back now. I have been vegan for over 5 years and have honestly never felt better. I know it sounds like a cliché but its true. I wouldn’t follow any other lifestyle diet. My health, mindfulness and the ability to truly understand the origin of food. Food is not only something that stops the hunger pains, it fuels us to nourish our mind & body. It means becoming more aware of our food choices, to not only see the meal that sits in front of us but to know its journey, its story and to think beyond our own self. We are not the only being that has feelings, and I wish not to inflict any unnecessary pain on our animal friends just for a meal. We can survive without food that had a mother or a face and my journey of veganism is to help change people’s perceptions that meat is not a fundamental part of our diet and we can live on plant-based fare alone. I train in three main disciplines – swim, bike and run. Zac and I started our fitness journey with a pair of trainers participating in fun runs and half marathons. In November 2012 we purchased a bike and since then we found an interest in triathlons - so now we do all three (but running will always be our favourite). We train 6 days a week often twice a day with one session in the morning and another in the afternoon. In the lead up to races and events we train up to 15 hours a week and for our recovery weeks, we train around 7 hours. We always seem to be in lycra! Soon, I am currently in training to become a Spin instructor. For the moment, I offer motivation to get off the couch and start something! I have a coach who trains & supports us through our fitness goals, and we believe we have what it takes to help inspire and motivate others to love exercise and movement as much as we do. Triathlons and marathons - are they classed as a sport? It has to be our lack of consumption of key nutrients such a protein, calcium and iron and that because we don’t eat meat we are all fragile and weak. I addressed this by starting Tarian Pantry. I wanted an avenue to prove firstly that vegans are not weak or malnourished, plus vegans eat a diet rich in plant-based foods not just lentils and tofu. If you lead by example, those misconceptions will fade and our diet choice will be seen as nothing but a positive one. My strengths are my personal and business message, Powered by Plants plus my determination to never give up when all I want to do it stop and rest. I’m not sure if I’m constantly trying to prove something to other people but if I am, then this gives me more strength and as I say when times are tough, ‘my weakness is my strength’. Every training session and every race is my biggest challenge. I set personal goals and work hard to achieve them but not every race is conquered with ease. My challenge is to back myself and believe I have what it takes to achieve greatness. We must remember that we are always racing ourselves and not the people around us. We train with an extremely strong and motivated group of fitness conscious individuals and they are nothing but supportive, not to mention interested in our lifestyle diet choice. Our ability to train as hard as they do and recover without the help of a whey protein shake and steak is fascinating to them and we know our love of kale, pea protein and tofu is rubbing off on them so that’s all the support we need. Always, especially when I do the cooking! They say the proof is in the pudding. When the pudding is a raw cacao pudding with coconut ice cream and fresh berries they are 100% supportive. When we changed our eating habits, we also started to spend more time in the kitchen, as you can’t adopt such a diet without getting your hands (and a few dishes) dirty. “But where do you get your protein from?” We answer this one by simply replying, “From a varied and balanced diet rich in vegetables, grains, legumes, nuts, seeds and fruits.” I am not sure the person who asked that question would be able to answer that with anything other than ‘meat’. When you follow a vegan or plant-based diet, suddenly everyone around you becomes an expert in nutrition. We wouldn’t be able to do what we do lifestyle and exercise wise if we didn’t eat a balanced diet. Likeminded individuals and vegan athletes such as Rich Roll, Scott Jurek and Brendan Brazier are always inspiring me to push myself to the limits. 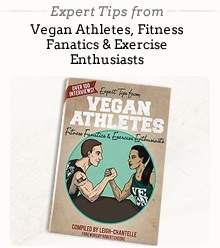 Not only for their vegan lifestyles, but their ability to be able to train and race hard, and prove there are no limits to what the body can do. I am also motivated by those closer to home, my vegan husband, my coach and my training partners, who each have a goal and work bloody hard to achieve it. Fitness is more than just getting muscles and being able to run a marathon, its about mental strength and conditioning to believe you can do anything you set your mind to do. For breakfast on the go: Bircher muesli with coconut yoghurt and fresh fruit. When I have more than 5 minutes, a combination of Flip Shelton 5 grain porridge & Forage Quinoa porridge with stewed fruits and nuts. Either a soup such as kale, tomato, lentil and quinoa; or a rye wrap with beans, spinach, carrot, sprouts, beetroot and avocado. A dashi noodle broth with greens, zucchini, broccoli, kale and puffed tofu. Spirilina bliss balls or a chewy granola bar made with nuts, seeds and chia seeds. Protein - Greens such as kale, spinach, bok choy, broccoli and quinoa. Calcium - Tahini/Sesame seeds, Brazil nuts, tempeh, figs and dates. Iron – Spirilina, wholegrains, nuts and lentils. As an endurance athlete, I have to fuel with foods that are going to give me lasting energy, so I eat foods that contain ingredients such as chia seeds, goji berries, Medjool dates and nuts. I also fuel with potatoes, roasted and mashed sweet potato. I do take spirulina tablets for additional protein and aiding recovery, along with magnesium but as for Iron, Calcium or B12 supplements its not necessary as we get ample enough in the foods we eat. Gaining muscle - Swim! My arm muscles have never been so defined - plus the odd lifting of weights doesn’t go astray. Losing weight – Eat a balanced diet - and yes this includes raw chocolate. If you want to lose weight then stay away from the sugar and heavily processed food-like products. Maintaining weight – Eat a balanced diet rich in fruits, vegetables, grains, legumes, nuts and seeds. Simple really, just bring your diet back to basics and stay away from 99% of the foods found on the supermarket shelves. Improving metabolism – Eat a balanced diet and portion control. Toning up – Squats, swimming, running and eating a balanced diet. Are you seeing a trend here? Eat a balanced diet rich in organic wholefoods and stay away from the junk. Via my business Tarian Pantry – a business powered by plants. This website is a wealth of knowledge and weekly I write a blog about food, fitness, how to eat better, how to enjoy a plant-based diet, and generally how to really enjoy food, not to mention life. I also offer Tarian nutrition coaching to help people feel more comfortable and confident about following a plant-based diet. I certainly don’t want people to view this lifestyle diet as difficult, and I give tips and advice to make the transition to a vegan diet an enjoyable and tasty one. Get in contact and start practicing what we preach. Shop local, eat better, and exercise more. Food is our fuel and what we eat helps us power us for work, rest and exercise. Believing in the mindset “you are what you eat” will help you make better choices when it comes to what is served up on your plate each meal. We would love to inspire more to follow in our footsteps of our powered by plants journey. It’s one that keeps you full of life not to mention young in mind & body. Visit our website, find us on, Twitter, Instagram and Facebook.